Past ASEP Prexy is a professional lecturer at CE Dept! Engr. Frederick Francis Sison, a two-term president of the Association of Structural Engineers of the Philippines (ASEP) is the first part-time faculty hired to teach at the Civil Engineering Department with a rank of “professional lecturer.” This rank is assigned to teaching faculty (even without a PhD) who have excelled in their professional practice by occupying key positions in private or government institutions. Engr. 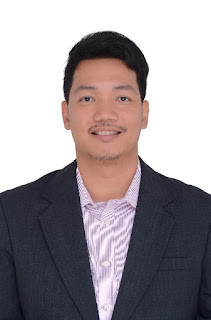 Sison who has a MSCE from UP, Diliman is a partner of the E.H. Sison Engineers, Co. (EHSEC) and consultant to various structural and geotechnical engineering projects. He is a PICE member and officer of the Makati Chapter, an ASEAN Chartered Professional Engineer and a member of the ISSEP. As a part-time faculty, he teachers Foundation Engineering, Structural Analysis and Design courses. Prof. Andres Oreta presented the research, "Investigation of Concrete Mixtures for the Concrete Cover Repairs of RC Square Columns," an undergraduate research by Anna Francesca Del Castillo, Romwell Louis Tan and Sarah Linette Cornejo at 14th International Conference on Durability of Building Materials & Components (XIV DBMC) held at University of Ghent, Belgium on May 29-31, 2017. The venue was "Het Pand", a former Dominican monastery which is also the cultural centre of the university. 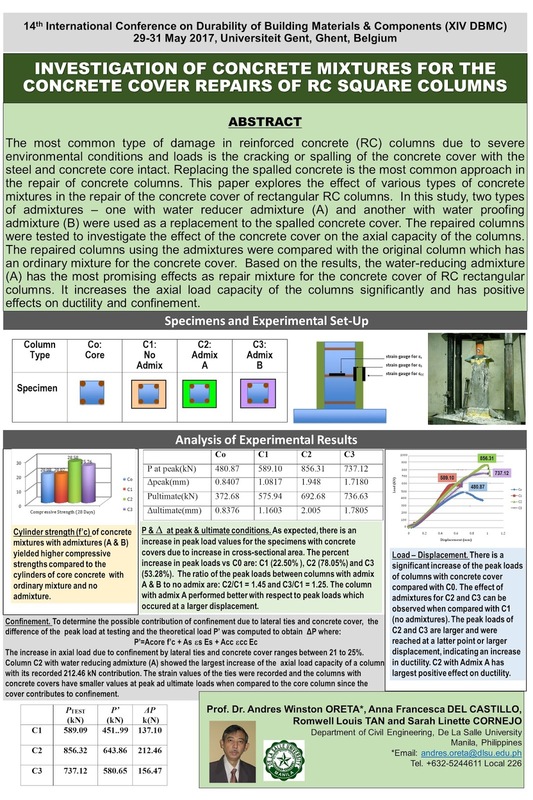 The paper explores the effect of various types of concrete mixtures in the repair of the concrete cover of rectangular RC columns. In this study, two types of admixtures – one with waterproofing admixture and another with water reducer admixture were used as a replacement to the “spalled “ concrete cover. The repaired columns were tested uni-axially to investigate the effect of the concrete cover on the axial capacity of the columns. Based on this study, the concrete mixture with the water-reducing admixture replacing the damaged concrete cover of rectangular columns showed the most positive effects such as (a) a significant increase of the confined compressive strength, (b) an increase in the ductility as reflected by the large displacements at the peak and ultimate conditions, and (c) reduction in the lateral strain of the steel ties at peak values showing its effectiveness in confinement of the RC column. 3D printed concrete - beyond durability?